A WFP distribution point at the St. Mathew’s Primary School, Chikwawa district, Malawi, the worst affected country in Southern Africa which is in the grips of food insecurity. An estimated 27.4 million people in southern Africa face food insecurity in the next six months, the Food and Agriculture Organization (FAO) and the United Nations World Food Programme (WFP) warned today, announcing the expansion of their operations to respond to the challenge, caused by poor harvests across the region. In a press statement issued today from Johannesburg, South Africa, the UN agencies cited poor harvests experienced by farmers across the region, which will negatively impact the capacity of vulnerable farmers to purchase seeds, fertilizer and other necessities for the current planting season. Lesotho and southern parts of Angola and Mozambique face food insecurity. Areas facing immediate threats are Malawi, Zimbabwe and Madagascar, where severe crop failure due to extended dry spells, extensive flooding and impactful tropical storms have resulted in increasing food insecurity. Malawi is experiencing the worst food insecurity in a decade with nearly 2.8 million people reported to be food insecure. WFP is planning to assist 2.4 million food-insecure people during the height of the lean season, the period prior to the next harvest when domestic food stocks become depleted. The agency says it also plans to implement social protection plans such as food assistance with cash transfers and have already assisted nearly one million people who have been affected by floods. FAO has supported the Government of Malawi in preparing the agricultural section of the national food insecurity response plan. This would include provision of inputs, with an emphasis on drought-tolerant crops such as cassava, sweet potatoes, sorghum and millet and on supplementary irrigation in order to cope with potential prolonged dry spells. The agencies report that in Zimbabwe, an estimated 1.5 million people are expected to be food insecure in the coming months after harvests were down by 50 per cent than last year. FAO is working with the Government to rehabilitate 34 irrigation schemes and increasing rural finance access to 127,000 smallholder farmers to adopt climate smart technologies. The agency is also providing support to 40,000 smallholder households to engage in commercial livestock production and assisting in distributing vaccines for the foot and mouth disease outbreak in the country. FAO has also prepared a drought mitigation programme, for which there is a financial gap of US $32 million to support livestock and crop farmers with stock feed and seeds respectively, in the most affected parts of the country. WFP plans to assist the Government and partners by providing cash and food transfers to over 400,000 vulnerable people which could scale up to 850,000 people during lean season. Both agencies focus on building resilience in southern Africa by promoting and supporting climate smart technologies, social protection schemes, refurbishing and construction of water management systems, tree planting and terracing to prevent soil erosion. The agencies report that food prices may soar early in the season which could cause further hardship for poorer households. Both FAO and WFP have reaffirmed to collectively help the governments in the impacted countries improve food price monitoring. Lastly, the UN agencies report that along with food security, the region faces the highest level of chronic malnutrition in children and HIV prevalence in adults. 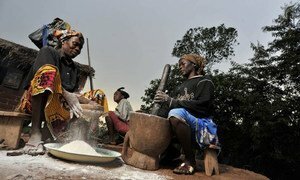 The first global agreement involving all stakeholders of food aid aims to “do business differently” in order to combat hunger and undernutrition among people living in protracted crises around the world, the Food and Agriculture Organization (FAO) said today.